Here’s a disruptive idea for the corporate world: let’s get rid of the traditional “open headcount”. One thing struck me while watching the Netflix culture slides: the company doesn’t have a vacation policy. They don’t count how many vacation days employees take. I thought, what else could we stop counting? For a relatively small company (~100 people max), I am convinced that we can stop counting open headcount. We just need to know whether this particular candidate can or cannot be hired and paid, right now. I am claiming that in a culture of trust the rest of checks and balances don’t add anything to the process, except time. Consider the following situation. My team has four team leads and a total of about 35 developers. We have a structure built to create small teams of 3 to 5 people that are focused on a component or a service. These are usually relatively independent and work in an agile manner with, hopefully, not too many dependencies. I have about a dozen total open headcount and spend a significant amount of time allocating various heads into the organization chart. Let’s illustrate this as a hypothetical steadily growing organization (the kind we all want to be in). Let’s zoom into the picture of available vacancies. To arrive at this chart and list we went through a decision making process. The team lead expressed a need for a person. 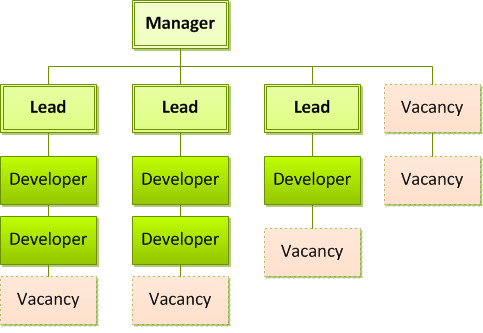 The development manager balanced an organizational chart. The VP of Engineering ran the personnel numbers in the division. A budget was built for the company summing up all divisions. Some total budget was approved and split. By the time the light turned green on hiring these positions, everything had changed. Two people left the organization, the customers started being more vocal about the user interface, we got better than expected response for our latest feature, we sold a lot more services vs. software and we had several new ideas. When the open headcount came back from the process the rosy picture of available vacancies should have looked radically different. Worse, a number of positions remained unfilled from the previous budget round because we failed to find the right people in a super-competitive heating-up New York tech landscape and we really had 12 open positions, not 5 in one organization and none in another where they were badly needed. Let’s project this experience into the realm of product development. Imagine that a single open headcount is a product feature. You discussed and planned all the features, wrote detailed specifications, and wrote the code, but by the time you were done everything had changed. Your project failed and the customer didn’t get what he wanted. You followed a waterfall process, and it definitely didn’t work for software. So why are we applying the waterfall process to open headcount? What if we created a backlog of positions to hire and picked from the top, for the entire company or at least a division? If I only could hire 2 positions out of a backlog of 5, wouldn’t I be better off hiring a priority 3 and a priority 5 versus hiring nobody at all? Ask yourself one question: how am I doing right now against the fixed amount of money or personnel that I have available for hiring, today? If you own a budget (VP), build and maintain a backlog of positions that your division needs. Make the backlog transparent and tell your people the truth about the budget boundaries. If you’re a gatekeeper (manager of managers) monitor the numbers as they evolve and signal when they are approaching the stop sign. If you’re the hiring manager or team lead, then focus on the next one or two positions. Work the backlog. Don’t worry, the gatekeeper will tell when interviewing your next candidate is unrealistic based on budget. Keep the interviewing process running at all times. The actual paper offer will be the final check with the VP, CFO or other person in charge of budget, which will make sure that the money is actually available to pay this person. Money truly matters only on the day you have a candidate that you’re ready to hire. We’ll call this agile headcount. Thoughts? Agile Hiring: get rid of the open headcount was published on December 27, 2010 . See a typo?